This page compiles information on a range of initiatives and programs that can assist youth service providers to help prevent and end youth homelessness. The page includes policy guidance, best practices, publications, tools, and links to other agencies and organizations. 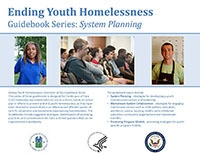 This page provides guidance documents from HUD on defining youth homelessness and identifies agencies and organizations with whom HUD partners to assist homeless youth service providers. These rapid re-housing (RRH) program profiles demonstrate successful approaches for assisting transition age youth to obtain and retain permanent housing. This page provides resources and case studies about effective strategies for cross-systems collaboration among housing and service providers for the homeless and the education system. HUD has published new resources to assist communities to better count youth experiencing homelessness. While the tools are optional, they are designed to provide unique insights from communities and experts across the country about how to better plan and conduct a count of youth experiencing homelessness, in the context of Point-in-Time (PIT) counts. The FY 2017 YHDP NOFA was published on January 17, 2018. The deadline for submissions closed on Tuesday, April 17, 2018 at 11:59:59 PM EDT. The LGBTQ Youth Homelessness Prevention Initiative helps identify successful strategies to ensure that no young person is left without a home because of their sexual orientation or gender identity and expression.